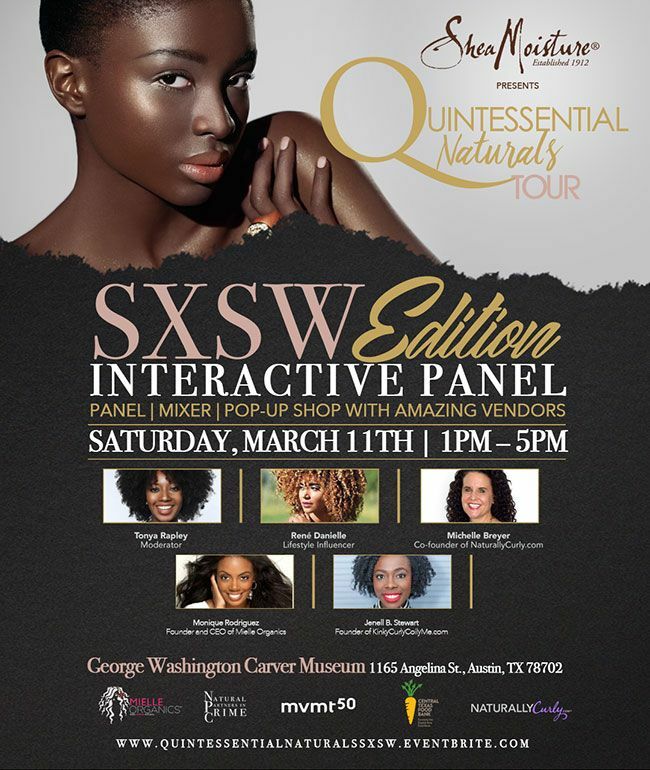 Austin’s annual SXSW festival is quickly approaching, and we’re thrilled to be the media sponsor for the Quintessential Naturals Tour hosted by Natural Partners in Crime. The NaturallyCurly team will be at the event with a fun social experience, along with an interactive panel and activations from some amazing brands and influencers. I spoke to Sabrina Boissiere, founder of Natural Partners in Crime and the event’s producer about what attendees can expect at the first stop of the tour. I wanted to put together a well-rounded tour that encompassed hair care brands, influencers, and local businesses. As an event producer for over 5 years in the natural community, I’ve been to a lot of events and tours and I’ve seen the excitement. Being a New Yorker you always have amazing events, and Atlanta and Dallas, but living in other cities you often get missed. The thought process behind Quintessential Naturals was encompassing what the word “quintessential” means, and that is representing the most perfect or typical example of quality or class. So top of the line brands, top of the line influencers, amazing businesses and brands that are local that you can showcase at your event. I picked the 5 locations because realistically I wanted to make sure I hit some top markets: Austin, Boston, Charlotte, Philly, and Miami. SXSW is a machine in itself but it had never had an official natural hair event. I started working with mvmt50 which is a black tech organization, and they said they want to partner with you and do something at SXSW because there are so many amazing naturalistas that come to this event. They said NaturallyCurly has been someone they’ve worked with for the last few years, and that you come out support the community, you’re a digital media house and it’d be great for me to align myself with you as well, so that became a perfect marriage. The first stop, SXSW, is a very unique event in that it’s at a historical museum the George Washington Carver, we will have an amazing panel, the theater space, and we have different types of activations where people get to experience these brands on a different level instead of just going to a table and buying things. I’ve never been to SXSW before, I know it’s a machine and we already have 1200 RSVPs so we’re gonna have a lot of bodies there. When I reached out to brands I wanted to make sure that whoever came on board had a lot to offer, so when I reached out to SheaMoisture I was really fingers crossed that they would come on board. They understood the vision that I had and they’re about exclusive inclusivity. So basically they have something for everyone. They’re always on the cutting edge of having great products, and this is their 25th anniversary so I’ve been working with Rich and the team to showcase some of the things they’re going to be dropping this year. Throughout the tour we have a charity component, which I’m really big on. I really wanted to focus on something really tangible, so we’re working with food banks at each stop. That’s important because it’s something they can physically bring and hand over to give to people in their community. There are people who are struggling to feed their families and pay their bills, it’s unfortunate but it’s the reality of this country. We’re truly honored to be working with the Central Texas Food Bank as the charity selected for the SXSW stop. As a leader in the fight against hunger for nearly 35 years, CTFB's mission is to nourish hungry people and lead the community in ending hunger. SheaMoisture upped the ante by saying that whoever brings two or more cans will get product from SheaMoisture. That’s an amazing thing that they’re willing to do. There are so many amazing businesses and brands that I haven’t even tapped into for some of these cities so I’m excited to see what the vendors have to offer – from beauty to skincare to makeup and of course hair brands, jewelry, accessories, just really showing the communities their own businesses. I think a lot of times we tend to shop outside of our communities because we don’t know any better, but this will give attendees a chance to support their community and hopefully, if things work out they will become consumers of these brands. That’s my goal when creating these events. We can’t wait to see the natural hair community in person! Our Co-Founder Michelle Breyer will be speaking on a panel with influencer Rene Danielle, Founder and CEO of Mielle Organics Monique Rodriguez, Founder of KinkyCurlyCoilyMe Janelle B. Stweart, and moderated by Tonya Rapley, Founder of My Fab Finance.